Dr. Flowers does thorough preparation prior to placing an implant to ensure long-lasting results. With recent breakthroughs in implant technology, Dr. Charles Flowers can offer dental implants to more people than ever before. Implants are one of the best and most reliable ways to restore your mouth and provide you with a great smile and a good bite for chewing food. Dr. Flowers excels in the placement of implants and beautiful natural crowns to complete the restoration. Over the decades, he has successfully performed several thousand implant procedures. Digital panoramic X-rays are done to give Dr. Flowers a detailed picture of your mouth. 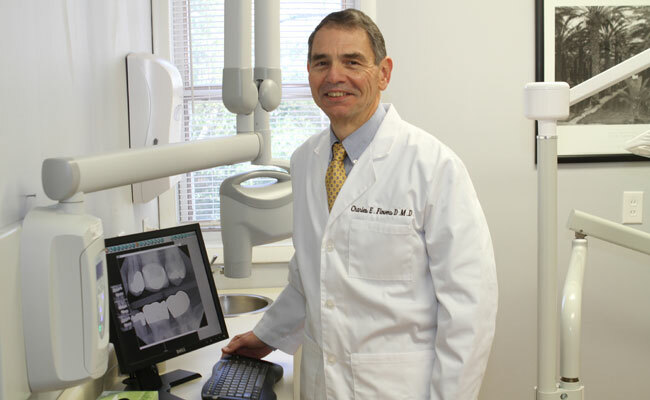 Dr. Flowers’ approach is to ensure long-lasting dental implants by making sure there is a healthy bone and tissue foundation created before or during the implant treatment. He starts by performing a very thorough visual oral examination and review of your preexisting health issues. He will take low-dose digital X-rays and closely examine all the data about your jawbone and its anatomy as provided by the X-rays and the oral exam. With this information he can create an ideal treatment plan, giving you various possible options. Dr. Flowers will discuss all of your options with you in detail. He will explain how implants are placed and show you images of implants he has done. Dr. Flowers does the implant placement himself in the comfort of his office. 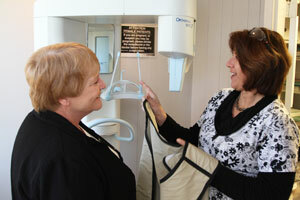 The dental implant procedure will take place in our state-of-the-art operatory. The implant procedure is the same whether one or all of your teeth are being replaced. The implant site is prepared, the implant is placed and the tissue is sutured. Dental implant placement is not a painful procedure. There is just slight pressure from the drill and then the placement of the implant. Some dental implant procedures can be completed with just local anesthesia. For longer procedures, you have the option of oral sedation. On your day of surgery we make your visit comfortable for you with blankets, an ear bud to listen to your favorite music, goggles to shade your eyes and a reassuring hand from one of our trained and caring dental assistants. When there is insufficient bone in which to place the dental implant, the amount of bone needs to be augmented with bone grafting so that an implant can be successfully placed. 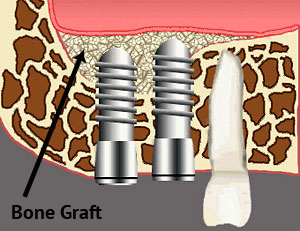 Usually the bone grafting can be done on the same visit as the placement of the implant. When teeth are missing from your upper jaw, the pressure in the sinus can cause the sinus to expand and the jawbone to shrink. This leaves insufficient bone to place your implant. A sinus lift allows Dr. Flowers to place bone graft materials that will stimulate adequate bone growth for your implants to be placed. Dental Implants are used in a variety of procedures for replacing missing teeth. Click on a link below for more information about a dental implant treatment.